Designed for quarter-turn, rotary or linear operation, Rotork CMA actuators perform numerous process control valve, metering pump and damper applications demanding precise position control and continuous modulation. Single-phase or DC electrical power is all that is required for simplified installation and control valve actuation. Explosion-proof certification to international standards is available for hazardous area applications. 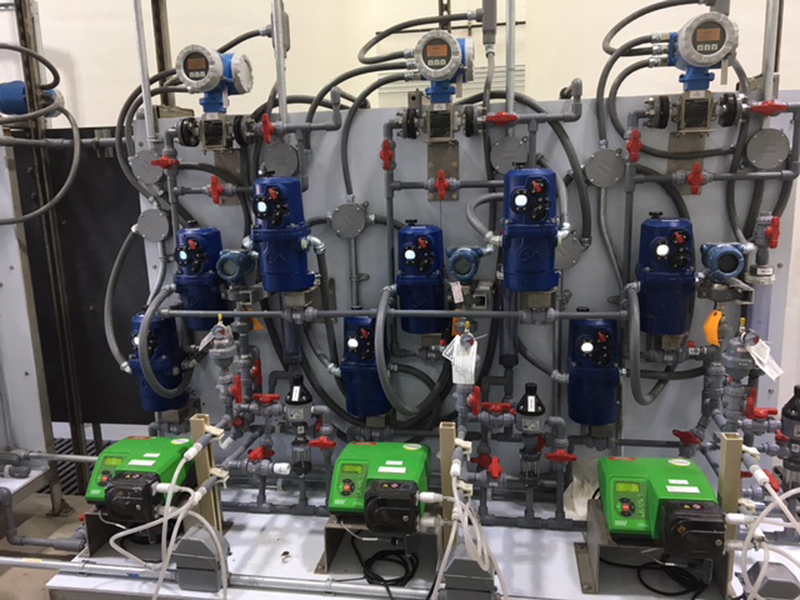 In a recent application CMA actuators have delivered a reliable, compact solution for a new chemical dosing application at a water treatment plant expansion at the City of Loveland, Colorado USA. The chemical dosing skids are part of a new chemical storage building, housing two giant tanks with a capacity of 46 million gallons per day (MGD). Operating mostly CPVC ball valves and some 4in butterfly valves on the chemical feed pump main and bypass lines, 21 CMQ 500 actuators control the delivery of chemicals to the various processes. The skid-mounted valves and pumps control the dosing of alum, polymer, sodium hypochlorite, fluoride, chlorine dioxide and sodium bisulphite. Local controls on the actuators contributed to their selection, being a possibly unique feature of the compact CMA design. They provide manual operation at the valve, combined with an LCD display of valve position that also incorporates critical and non-critical fault symbols. Control knobs enable selection of Local, Stop or Remote operation and Open or Close input commands in the Local control mode. Each mode can be locked in place to prevent unauthorised operation. The LCD display shows the valve position as a precise percentage of total valve travel. The maintenance-free CMA drivetrain, environmentally protected to IP67 and permanently lubricated for operation in sub-zero temperatures as standard, can be mounted in any orientation. Accepting an industry-standard 4-20mA control signal, the CMA provides accurate, repeatable and backlash-free positional control. Resolution is 0.2% on linear and quarter-turn applications and 2 degrees on the multi-turn models. All CMA actuators have output speeds that are adjustable down to 50% of full speed in 10% increments and manual operation is provided as standard. Network compatibility encompasses Rotork Pakscan, HART, Profibus, Modbus, DeviceNet and Foundation Fieldbus. When fail-to-position performance is required, a reserve power pack provides the actuator with the ability to perform a predetermined action on power failure. The power pack also preserves position indication on the LCD display during power failure. When mains power is restored, the power pack is quickly recharged to ensure continued fail-to-position functionality. Katie Wilson is with Rotork.